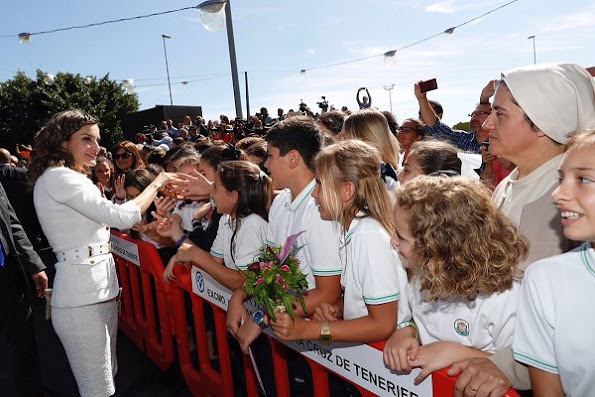 On the last day of their Canary Islands visit, King Felipe VI and Queen Letizia met with representatives of the Canarian business associations held at the headquarters of the regional Government in Santa Cruz de Tenerife, the Canary Islands, Spain. I do not like her hair. The curls are over-the-top and the braid around her forehead is bizarre. That spoils her look as the suit is very nice. Crisp and tailored. On dirait un perruque .On l'a vue mieux coiffée . Not so good today. Agree with Heather..
Love her later look. Want her top! 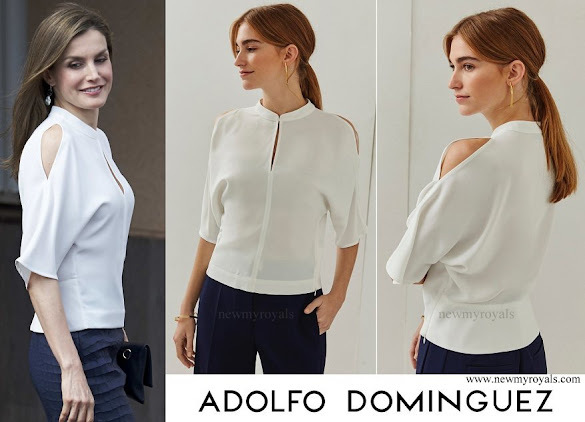 The second look is lovely, her top is modern yet elegant. The first one in the white suit is a total miss though. I didn't like this suit the first time I saw it and I remember suggesting it would only work if the epaulettes and the too many pockets and maybe even the belt were removed. I still think the same. But the biggest mistake here is her hair. Way too much curls but not the softer ones that so flatter Letizia's face and that silly braiding is just not doing her any favours. I understand this is a work of art of peluquería but still a no. Her earrings are gorgeous as usual though.